Thank you for visiting the International Society of Guatemala Collectors web site. 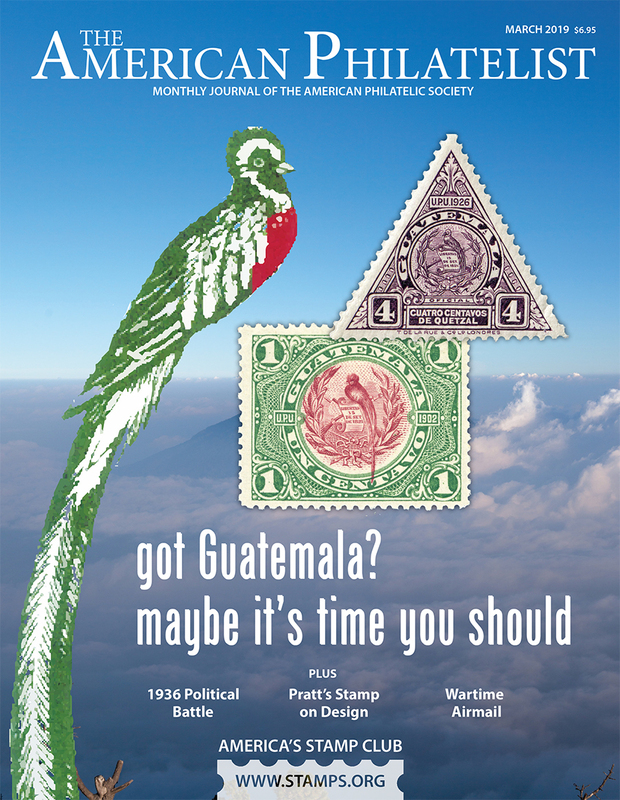 The ISGC is a non-profit organization and APS affiliate founded in 1948; membership in the Society is open to anyone interested in stamps and postal history of colonial and modern Guatemala and adjacent regions of Central America. All memberships include a subscription to El Quetzal (EQ), published four times a year. Members also have access to the member side of the ISGC website, where you may participate in the online Forum discussions, and have access to the entire run of back issues of EQ, starting with #1, published in 1949. 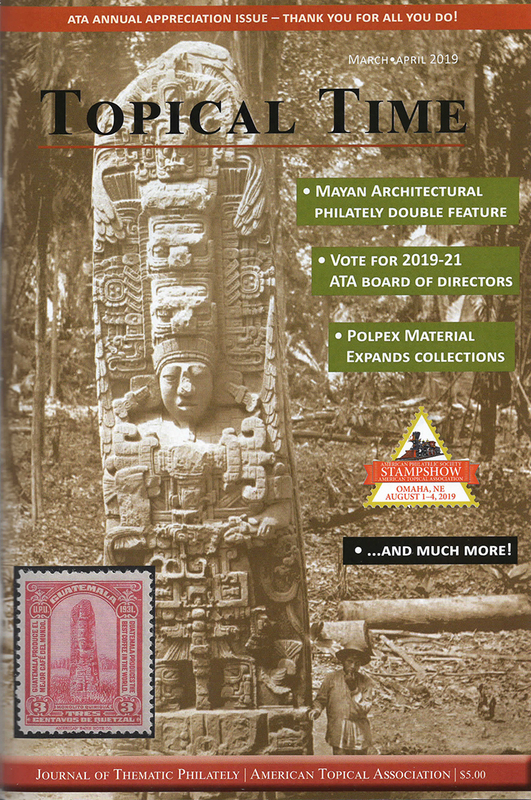 Guatemala-1, the out-of-print Volume 1 of the Postal History and Philately of Guatemala, is also available online to members, and plans are in the works to add other out-of-print ISGC publications. Join the ISGC, or renew your membership An online only membership is now available at a reduced rate. To watch the video got Guatemala?, an introduction to collecting Guatemala Stamps, click the play button on the YouTube player, and enlarge to full screen. 2019 Spring ISGC Auction Coming Up! The 2019 ISGC Auction is open for bidding starting on March 15th and will close on May 15th. The auction consists of 42 lots with many hard to find items of Guatemala philately. 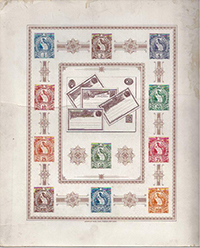 Featured in the auction are scarce covers with fiscal stamps used in the place of regular postage stamps (with many of the covers being accepted in the mail), the rare 1886 Official New Year's Souvenir Greeting Card, and many full sheets of more modern material that is difficult if not impossible to find on the market. Please review the rules and the bid sheet to assure that your bids are in the proper increments and that your bid sheet is dated. Ties go to the earliest bid received. High resolution images of any lots are available on request from the Auction Manager. 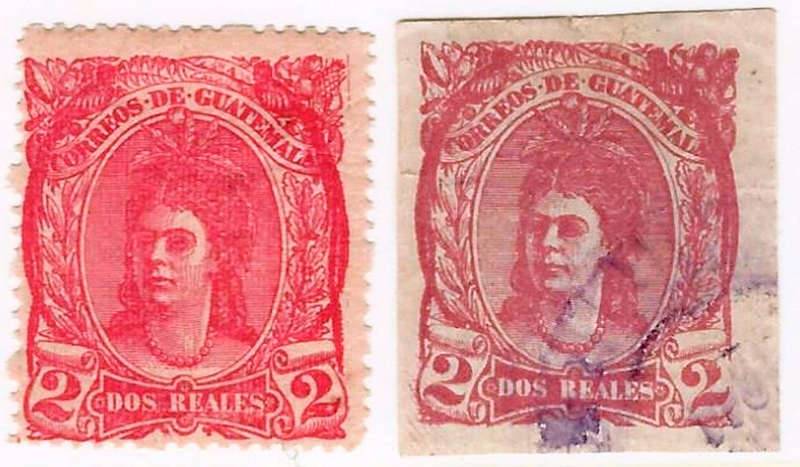 Collecting the stamps of Guatemala is an interesting and potentially complex challenge, and collectors of the country are helped by a large body of available information. El Quetzal editor and former International Society of Guatemala Collectors (ISGC) president David Reitsema has added to this information by writing three articles to assist ISGC members and other ISGC website visitors distinguish between genuine stamps and fakes and se informative articles. 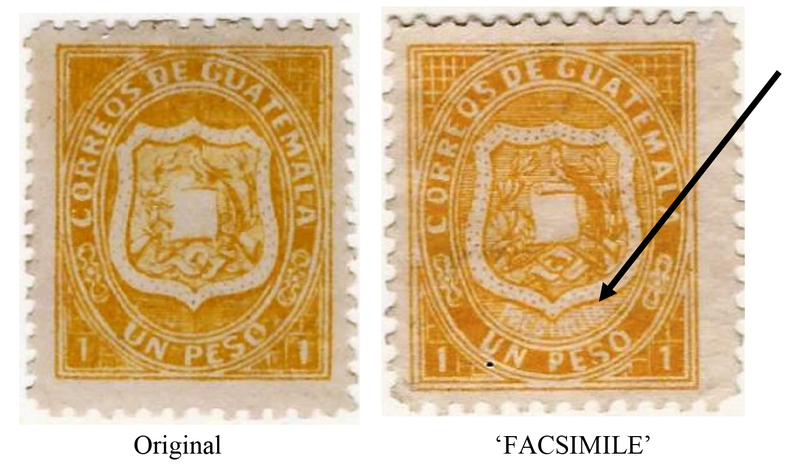 These are the first in a series of articles about Guatemala Fakes and Forgeries which will continue to be posted periodically on the website. Long-time ISGC member Jack Jonza has collected nearly 150 articles and clippings that have information of interest to Guatemala collectors. The articles come from many sources, including magazines that have not been published in many years. These have now been scanned and indexed, and may currently be viewed and downloaded in the Document Library by members after logging in. The first PDF in the folder (Jonza Documents Contents) was prepared from a spreadsheet containing information on the documents, including author, publication, publication date, catalog numbers,etc. Download it, then use the links in the titles to go to the individual documents that interest you. The ISGC will hold its next annual meeting on the last weekend of May, 2019 at the Rocky Mountain Stamp Show in Denver, Colorado. The show will feature a pan-Latin American emphasis. Joining the ISGC will be MEPSI, which is also holding its annual meeting at the show. Other Latin American philatelic societies have expressed their intention to be in attendance and involved in various ways. The ISGC has informally reserved 50 exhibit frames and we urge all members to get their exhibit applications in early (mid-October!). MEPSI and the Peru society also have each requested 50 frames. There are expected to be at least 360 exhibit frames and despite that number the demand will exceed available frames. At this time, members who have indicated they intend to present exhibits featuring Guatemalan material include Michael Bloom (two exhibits), Tim Bartshe, and Jaime Marckwordt. There will be seminars throughout the show on Latin American philatelic subjects presented by invited specialists and additional presentations during the show. Make hotel reservations early, there are not a lot of rooms available at the hotel venue and they will go quickly. The society will have social events planned and more details will be forthcoming. David Reitsema is the current editor of El Quetzal . Reitsema is one of the Directors of the ISGC and has previously served as its President. He has authored numerous articles in El Quetzal over the years. EQ has an entirely new format commencing with the December 2012 issue, and the printing quality has been dramatically improved. A PDF of the entire March 2017 issue has been made accessible on-line to the public to serve as an example of what is available to members. The cover of the current issue of El Quetzal, #377, March, 2019, including the table of contents, is available for viewing. Members may sign in to view the entire issue online in the Library section of this website. Past issues are also available. Please use the email address listed on the Join/Renew ISGC Button on the Menu to make dues payments via PayPal. The email address for the Treasurer on the Contact Us area is for communication with the Treasurer, not for payments. Exhibits now available for viewing: The Quetzal Airmails (Jaime Marckwordt), A Selection of Guatemalan Postmarks, 1871-1902 (Cécile Gruson), Collecting Guatemala (David Jickling, coordinator), Guatemalan Auxiliary Markings, 1898-1967 (David Fine), and Guatemala Airmail 1924-1945 (Dr. Andrew Cheung). Also available: PDF file of the Perforation Gauge Presentation from Washington 2006.